As a young dad, I’m always looking for ways to improve my fathering. Discipline is tough. I want my kids to grow up with mature character. Now, my frame of reference, when I say I want my kids to have mature character, is God’s standards as recorded in Scripture. However, this blog is not about the goal of Christ-like character as much as it is about effective principles for reaching that goal. 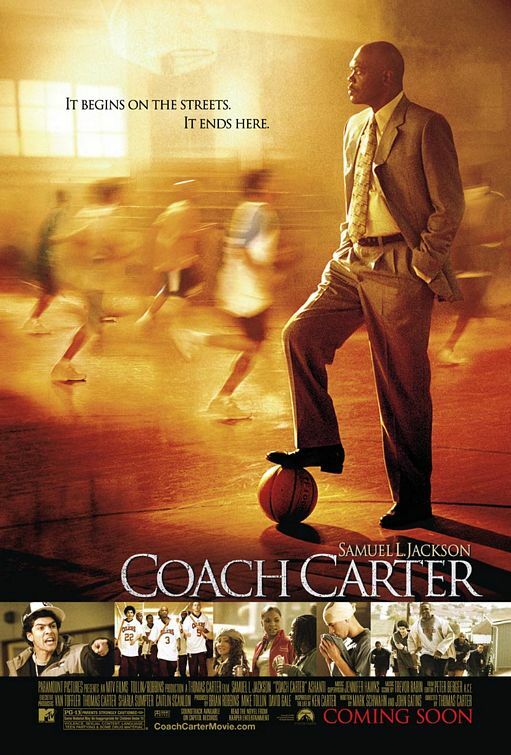 The movie, Coach Carter, is a case study in turning around a group of broken teens. Their family units are fractured. Their neighbourhood is disjointed. Their school system is faltering. Coach comes in with a very difficult situation and takes them through rigorous drills to bring them to a sense of respect for themselves, each other and authority. If you’re just starting out as a mom or dad. Seize your role as parent now. It won’t get any easier. If you have older children it may be difficult to change the poor habits you’ve adopted and also instilled in your child. But like Coach Carter, you can make the changes you need if you resolve to and you will see results quickly. Even though it won’t be easy, it will be worth it! So what will you resolve to do? You’ll need to decide what needs to change, but from this movie, we can glean some principles for parents. From the outset, Carter takes on the tough exterior attitude of his players. He comes in to his first practice and lays on them firm expectations at which they scoff. He gives them a contract with a few simple rules. You must have predetermined expectations for your child. For example, what do you expect regarding whining, sharing, attitude, chores, etc.? A contract is not necessarily a bad idea for your older children. For preschoolers, however, you simply need to state your expectations probably over and over. State your expectations clearly and firmly. But merely making your rules known to your children is just the beginning. The next part is resolve. For the rest of your years with your children you must sustain your determination to not give up on your kids and train them on to maturity. Resolve now to go beyond all of the antics your child will pull in resistance to your authority. Giving in to them will not lead them to the character you want to train in them. That’s not to say there’s no room for reasonable and calm negotiation on issues that may not be set in stone. But hold to the principles you’re seeking to establish. Your resolve shows itself in how much you enforce your expectations. Coach Carter takes extreme measures to enforce his contract. For example, when a player arrives late he assigns that player a large number of suicides or pushups. If that player gives attitude the consequence is doubled. There are logical consequences for your children like not getting what they want no matter how much they complain or requiring them to clean up the mess they deliberately made. Giving your children time (also known as a time out) to think and change their behaviour and heart attitude works well. You must decide on consequences that speak to your child. What is it that gets their attention? There is always something that will break their will…IF your resolve is strong enough. You must go to the nth degree until your child submits to your God-given authority. Now, being a parent is also being a coach. So coach not only with firmness, but also with playful love. Discipline without love will breed resentful children. That’s why I follow up each act of discipline with affection. It’s why I seek out time to just play with my kids or read to them. In the movie, Carter makes play calls by naming his “sisters,” each with a unique personality. This lightens up the rigid nature of practice filled with suicide drills and running. A parent focused strictly on discipline will miss out on the joy of raising kids. Balance your discipline with love. Consider how you discipline. Your consequences should be implemented swiftly, with no delay. Generally speaking, keep emotions out of the act of enforcement. Most of the time emotions, when gone unchecked, will defeat the purpose you are seeking to achieve. You will get caught up in anger and lose sight of the goal. Your actions speak louder than words. Just implement the consequence with no explanation or yelling required. Ahh, I see peaceful growth on the horizon. Of course that doesn’t mean you should be passion-less either. There is a time to express strong emotions and a time to restrain your emotions. Parenting is not an easy task, but those willing to stick it out will see great fruit. We will not always make the right choices. There are no cut and dry models to make the best decision each time. But we can steer in the overall right direction. You’ll find that sticking it out will bring about much greater benefit than checking out or flaring out. Are you willing to instill right character in your child no matter what resistance you face? Coach Carter faced strong opposition to his decisions, but he held fast to what he believed was right for the overall good of his players and community, even when the community couldn’t see that. You can do it! Your child must learn respect. It affects their decisions for the rest of their lives. If they don’t learn to respect you and submit to your authority, why should they learn to respect other authorities including God Himself? It starts with you as the parent. Their character is most strongly influenced by you. Coach Carter also plays a dad and when his son makes a decision that he disagrees with he says, “Part of growing up is making your own decisions and living with the consequences.” Your consequences consistently implemented in your young child is training habits in them that will guide their decisions as teenagers and adults. This should instill in you a sense of fear, not debilitating fear, but motivating fear. So check out the movie, Coach Carter, and see what you can do to improve your parenting for the overall character growth of your child. DISCLAIMER: There is inappropriate language and inferred promiscuity in the movie. Some viewers may be offended by the raw depiction of these youth and their community.